There’s the New Orleans stories that everyone knows, like Mardi Gras and Marie LaVeau, and then there’s the hundreds of lesser-known stories—the ones that remain just out of sight, as if wiping away a fine layer of paint or dust to reveal an unexpected work of art. I’ve been fascinated with New Orleans for as long as I can remember, the multi-layered history, the slightly edgy, gothic mysteriousness. With the proper research (and proper respect), New Orleans will occasionally let you peek behind the veil, but only on her timetable. I’ve also found that, even if you plan your travel itinerary (or story idea) to a “T,” New Orleans will invariably have other ideas for you. During my last visit, I had planned to investigate and write about modern-day voodoo culture, but New Orleans wasn’t having it. She created missed interview connections and showed me that (with the exception of Sallie Ann Glassman and Nicole at Erzuli’s), the inner city’s voodoo culture has mostly gone the touristy curio route. But all the while, New Orleans kept steering me toward other interesting, albeit lesser-known, places and stories to pursue, which were just waiting to be delved into. Here’s a few new favorite, recently discovered hidden gems. Anyone that’s looking for a one-of-a-kind experience would do well to include these 3 places on their next sojourn to The Big Easy, especially if visiting with a group. 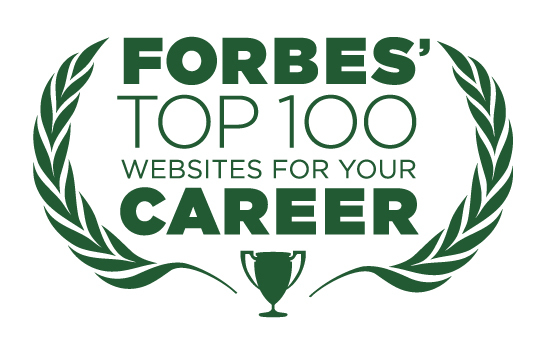 [Click on any of the photos to view larger versions]. When the taxi driver pulls up to the inconspicuous green-and-white door with the brass plate, he appears confused. He’s driven up and down Dauphine Street in the French Quarter a million times, but he’s clearly never been to this address before. “Are you sure this is the place?” he asks. I nod, smiling to myself, because I’ve seen it time and again: true opulence typically camouflages itself with understatement. If you weren’t looking for the incognito green door, you wouldn’t even notice it, but that’s the whole point. This is how celebrities hide in plain sight. After checking in at sister hotel Dauphine Orleans just a block away, we were ready to enter our luxurious weekend hideaway. Just beyond the green door lies a brick footpath lined with centuries-old Crepe Myrtle trees, the largest I’ve ever seen, that lead past the private courtyards to a historic – but heated! – saltwater pool, reportedly the oldest in town. We were staying in Cottage #3, the first green gate on the right, which I was told was Elizabeth Taylor’s favorite whenever she was visiting New Orleans. Unlatching the wooden gate, we were greeted by an unusually large brick patio, lush with greenery and a working water fountain for added ambiance. The ample cottage is U-shaped, consisting of two separate king-sized bedroom suites with walk-in showers on each side, joined at the “bottom” by a large living room off the entryway with hardwood floors, comfortable furnishings, elegant art and antiques, plus a large wooden dining table and four chairs. Our cottage was the ideal size and layout for a girlfriend getaway or two couples traveling together. Our stay also came with a complimentary welcome drink at the infamous May Baily’s Place at the Dauphine Orleans, formerly one of the better-known bordellos in the Storyville red light district from 1897-1917, when prostitution was legal. A framed copy of the original operating license still hangs in the Victorian-style bar, along with portraits of the area’s most famous madams by photographer E.J. Bellocq. Records of the Dauphine Orleans’ site date from 1775. Before being a brothel or bar, the building was purportedly a convent that also served as a hospital during the Civil War where many soldiers didn’t survive their injuries. Many stories exist of Creole and Confederate soldiers still roaming the bar and back courtyard, sometimes with “well-dressed ladies of the night.” A red light illuminates the back entrance and inner courtyard of May Baily’s, just as it did in Civil War times. There are also rumors of “The Courtesan,” a bartendress who has lingered at the bar for more than forty years, frequently moving bottles around to her preferred arrangement. Conversely, the living bartenders at May Baily’s are friendly and the vibe is incredibly relaxed, a welcomed respite from the typical revelry of other French Quarter drinking establishments. May Baily’s also seemed to be the preferred spot for chefs and waitstaff from nearby upscale restaurants to have an after-work drink, (an authentic stamp of approval to anyone that’s ever worked in the restaurant industry). Back at the Audubon Cottages, there are also ‘haunted histories’ for Cottages #2 and #4, including regular sightings of a pacing soldier on the upstairs balcony of #4 (pictured above) that likes to whistle and listen to country music. However, the most interesting history at the Cottages by far is its namesake former resident. 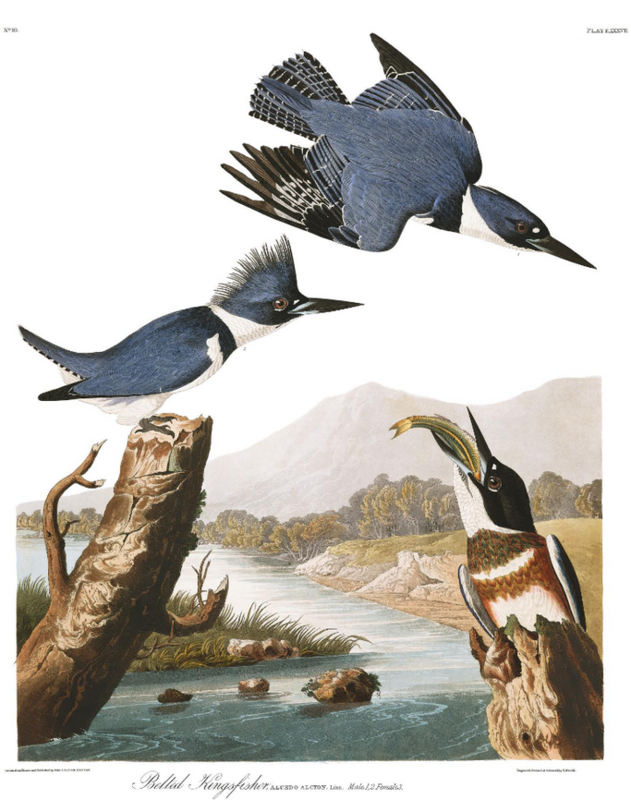 From 1821-22, John James Audubon resided in Cottage #1, while working on his series of 435 meticulous, life-sized illustrations of birds in natural poses and settings for the gargantuan Birds of America tome, now universally accepted as the “definitive ornithological reference book.” Free high-res downloads of Audubon’s beautiful hand-engraved plates like the one below are available from John James Audubon Center. Complimentary in-room gourmet coffee, tea, bottled water and soft drinks with to-go cups, replenished daily. (Sightseeing is thirsty work! I can easily spend $25-30 a day for coffee, tea and bottled water while on vacation). 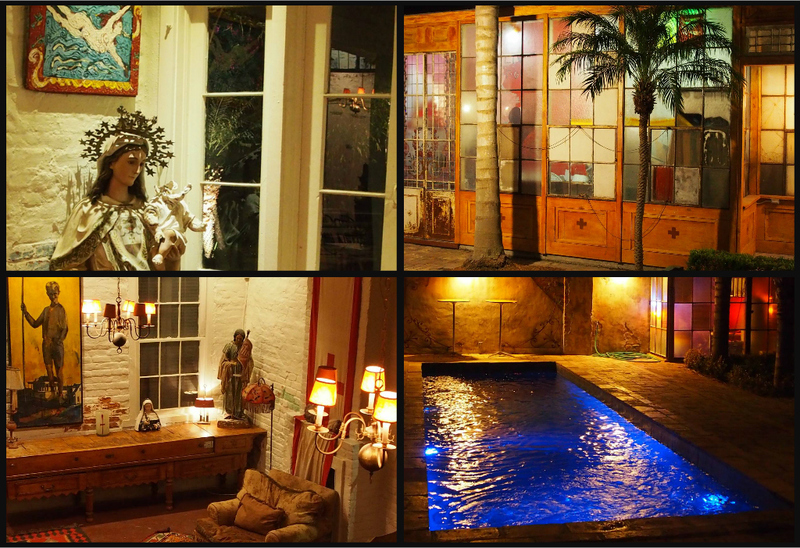 Location: Because we were in the heart of the French Quarter, we were in short walking distance from Royal and Bourbon Streets, restaurants and attractions, which saved immensely on taxi services. The other noteable perk is, even though located on a busy street in the Quarter, your cottage and private patio are unbelievably quiet. The unassuming green door truly does lead to another world. Since 1918, Arnaud’s restaurant has been serving flavorful Creole classics to the fine-dining masses, from Turtle Soup to Alligator Sausage to Oysters and Shrimp Arnaud, marinated in their original recipe, made-to-order Creole Remoulade sauce. The largest restaurant in New Orleans, Arnaud’s boasts 14 private dining rooms (all outfitted with beautiful chandeliers and antiques) that expanse nearly a city block, as well as a historic Speakeasy bar and fantastic Jazz Brunch on Sundays. 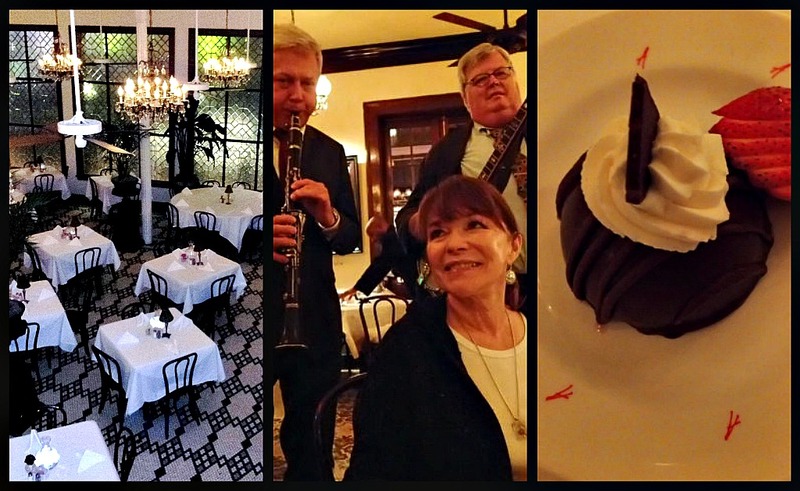 It’s the sort of white-tablecloth, old-school fabulous restaurant with roving Dixieland jazz musicians and top-notch service (ask to be seated in Jonny O’s section, you’ll thank me later) that lends a rare glimpse of the New Orleans glamour of yesteryear. Dining at Arnaud’s is culinary time travel at its best: You can easily imagine arriving by horse-drawn carriage to the original gas-lamped entryway in any century. To continue with the glamour-time-travel experience, head upstairs after dinner to pay a visit to the Germaine Wells Mardi Gras Museum onsite. Restaurateur and daughter of Arnaud’s founder, “Count” Arnaud Cazenave, Germaine Wells was named Mardi Gras Queen 22 times, from 1937-1968, more than any other person in the history of Carnival. The museum has 13 of her incredibly ornate, hand-stitched Mardi Gras Queen gowns on display, (including one that she had an exact replica made to be buried in), several King and Queen costumes worn by family members, as well as a collection of well-preserved vintage Easter hats, Carnival masks, krewe invitations and photographs. 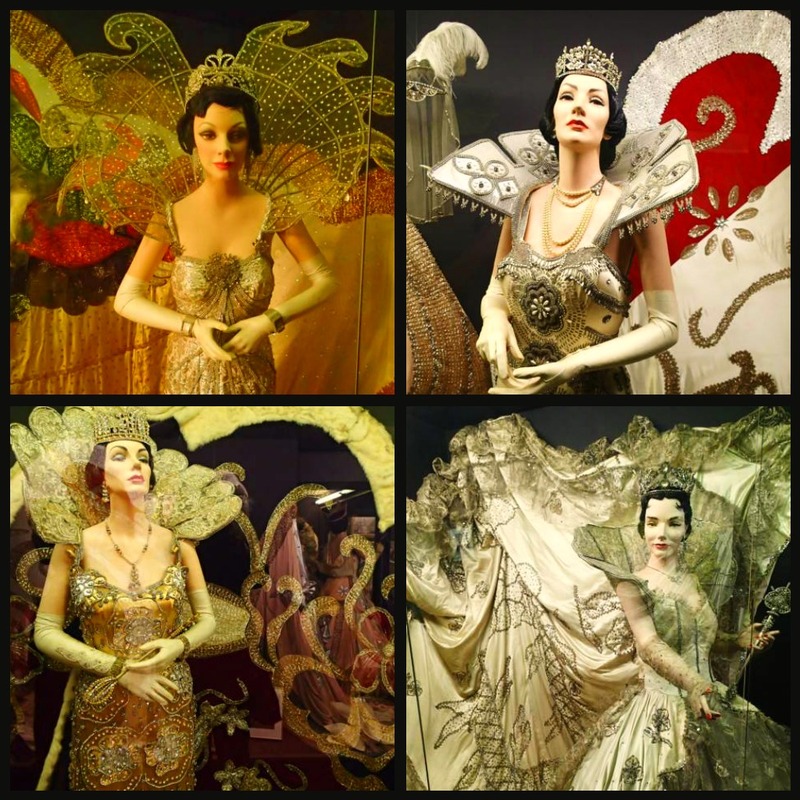 What makes this “hidden” museum so memorable (and more than a little creepy) is that nearly all of the mannequins displaying the Mardi Gras finery were created in Germaine’s exact likeness. The direct gaze and range of (often haughty) expressions of her mannequins are just a little too lifelike. Maybe it’s because we were the only ones there, or maybe it was that the fluorescent lighting had a slight flicker, but the whole experience started to quickly feel like an episode of “Night Gallery.” We completed the rest of the short tour around the museum wide-eyed and silent, not daring to say anything critical about the display, as if Germaine herself (or 13 Germaines) were listening. The Germaine Wells Mardi Gras Museum is free and open to the public 7 days a week during restaurant hours. 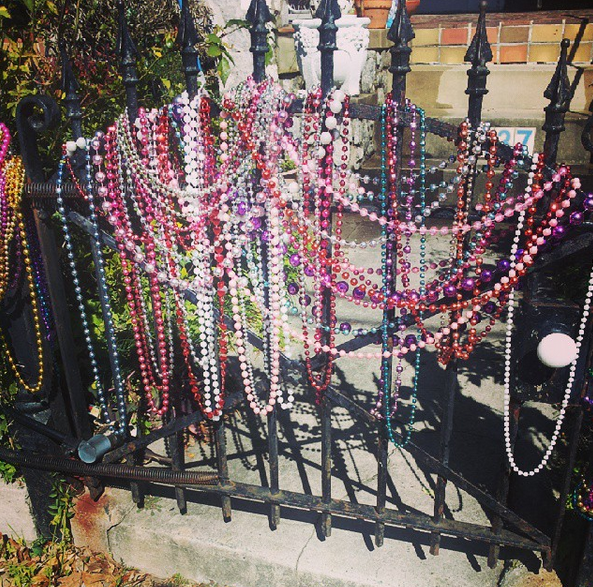 Traveling to New Orleans with a group or to celebrate a special occasion? 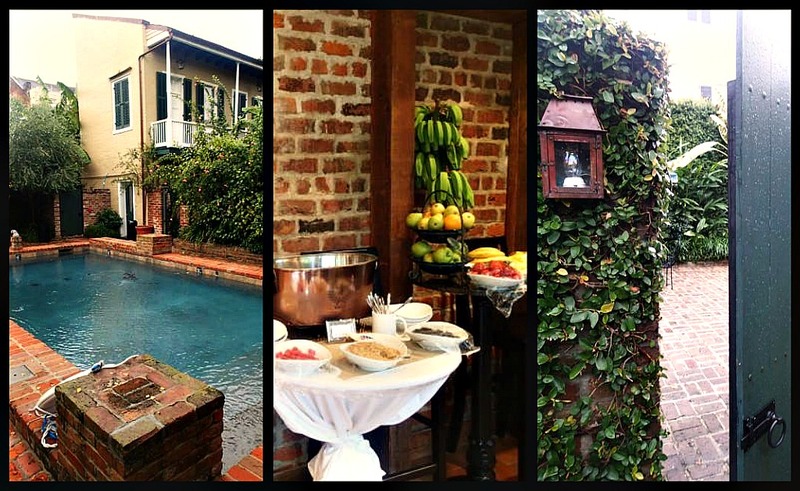 Why not consider renting a historic, 6500-square-foot “compound” along the Lower Garden District waterfront that sleeps up to 10 people instead? Built in 1836 and voted one of the world’s coolest villa rentals by Travel + Leisure, the gorgeous Race + Religious property contains a two-story Creole cottage, three-story Greek-revival rowhouse, two-story ‘Slave Quarter,’ fountain-flanked slate pool, two adjoining brick open-air courtyards and mature palm trees, as well as two commercially-equipped kitchens, working indoor and outdoor fireplaces, stereo system with interior and exterior speakers, balconies overlooking the courtyard—and the city—that at night are awash in the golden glow of flickering gas lamps. Another 30 years was spent refurbishing the property and filling it with exquisite, hauntingly beautiful artwork and hand-painted murals from local artists and a large collection of religious iconography, like the Virgin Mary statue (pictured below) that was salvaged from a bulldozed church in Mississippi. Other artifacts and furnishings came from the couple’s world travels: a multitude of colorful rugs from Iran and Afghanistan adorn the hardwood and clay-tile floors, the heavy wrought-iron gates (above) and the stained glass windows (below) brought back from Buenos Aires. Property Manager, Sarah, informs us that there are only 11 original Creole cottages left in New Orleans and Race + Religious is proud to have one of them. Other architectural details of note: the original wall bricks were formed with clay from the banks of the Mississippi River and fired on Tchoupitoulas Street; the upper living area of the Slave Quarter built with large wooden beams from decommissioned river barges. The historic Slave Quarter was the most powerful part of the experience, as everything from the giant cooking hearth and walk-in pantry to the walkway with its trap-door stairs between the Quarter and the rowhouse remain as they were when in daily use during the 1800s. While the terrible history of slavery in America is not a subject I enjoy, other such historic buildings have only been solemnly viewed from behind velvet tour ropes. Never before has there been an opportunity to sit alone in a tiny living space once inhabited by slaves, or to touch the door handles and walk the stairs they did all those years ago. Experiencing everything Race + Religious has to offer requires a bit of time to take it all in. Every time I walked around the expansive property, I noticed another detail or artwork I’d missed previously. 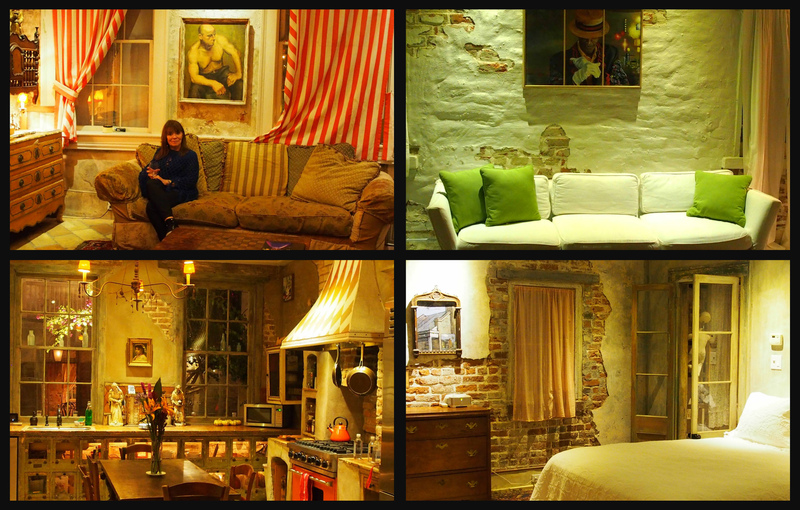 Because our accommodation was clearly the main attraction of the evening, we elected to stay in to get the full experience, ordering some delicious take-out dinner from nearby Cochon Butcher to savor by candlelight in the privacy of the open-air courtyard. Overall, the Semmes have done a remarkable job in bringing the place back to life, with great care taken to preserve the cultural heritage and historic ambiance, most evident in details like the chipped plaster walls with exposed brick or the unvarnished Slave Quarter stairs that still bear the worn patina of a thousand footsteps. The overall result is the intimate feeling of living like a local, staying at a friend’s house in town (if that friend were an avid art collector), or a mini-museum that you can make yourself at home in. Race + Religious truly is living history. While a highly popular venue for weddings and events, Race + Religious is underutilized as a getaway for a group of friends or family traveling together to New Orleans (as we were). Due to the age and delicacy of the antique furnishings and extensive artwork collection (some with more mature subject matter), a stay at Race + Religious seems better served for adult guests or older teenagers—but one that you’ll never forget. Reservations can be made by contacting Race + Religious directly, for $1000 per night or $6000 per week—an unbelievable deal when split 10 ways. All photos: © Tiffany Owens | ModernDayNomads.com. May not be reproduced without permission.